If you would like to experience something different, then Simurgh is for you. 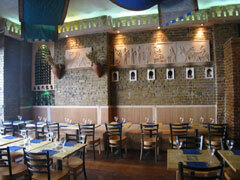 Conveniently located in the centre of London, it offers exquisite dishes to food enthusiasts. Both rooms are beautifully decorated in classical Iranian style creating a perfect environment for the Saturdays belly dancing. The Persian cuisine is considered to be one of the world's greatest cuisines next to the maybe more obvious ones like French and Italian. The Persians use a wide variety of herbs in their cooking and have several different varieties of rice dishes. Persian cookery is healthy, balanced and exotic with an emphasis on high quality ingredients and tantalizing, refined flavors The Persian dishes are mildly seasoned with salt, pepper, saffron, and lemon juice which appeals to almost everyone's taste including children. Expect a variety of meats (beef, chicken, lamb, salmon, mahi mahi, white fish, shrimp). White rice is the typical side dish, although you can substitute vegetables, salad, or potato.